An integrated enterprise system is a necessity for sustained growth and development, while keeping your organization competitive. Increasing the quality and visibility of business information is the key to increased customer satisfaction and improving your bottomline. The alternative, disconnected “islands of information” waste your company’s time, energy, money and contribute to poor decision making. infowebtechsolutions, ERP software company headquartered in krishnagiri (India) has developed Intact ERP software (Enterprise Resource Planning) that helps manufacturers and traders from small businesses to mid-size enterprise see business transactions more clearly. This development delivers new customised ERP software solutions, as also inventory management systems and other development applications services. Integration of Data across the enterprise ensures that you have greater visibility in all areas of your business, from daily operations and services to a strategic decision-making level. 2. Cost saving solutions through organized business processes. 3. Integrates business processes facilitating better control. 4. 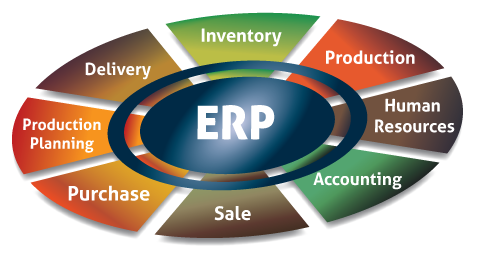 ERP improves the work flow and information flow in the organization. 5. Introduces transparency in activities. 6. Improves speed and efficiency in functions leading to improved customer service and customer satisfaction. 7. Facilitates co-ordination of activities between different departments. 8. Provides quality communication channels leverage. 9. IT Infrastructure and information assets.